I’ve been spoiled recently. It has been awesome outside, and I rode my bike to work a couple times in the last week. This morning, however, I drove the Jetta to work and I was nearly hit twice. Maybe it was that the Jetta is a smaller mid-size sedan and was harder to see, or maybe it was that the Jetta’s diesel engine is on the quieter side, or maybe it was the fact that both near misses were caused by drivers talking on cell phones. Granted driving is relatively simple at times, there are other times that demand more attention; be it lane changing, traffic lights, stop signs, intersections, merges and yields. I really think it unfortunate that I am seeing more and more near misses with drivers on cell phones (to be honest not all, but many!). I found this cartoon kinda funny… but if you have hit a deer, you might not. I have written about Skype before. I just had to post this note. Skype is now allowing Free calls to all landlines and mobile phones within the US and Canada… for the rest of 2006! If you still don’t know what Skype is you really need to go find out, free calling between computers… and now, free calling from computer to any phone in USA or Canada! Awesome! 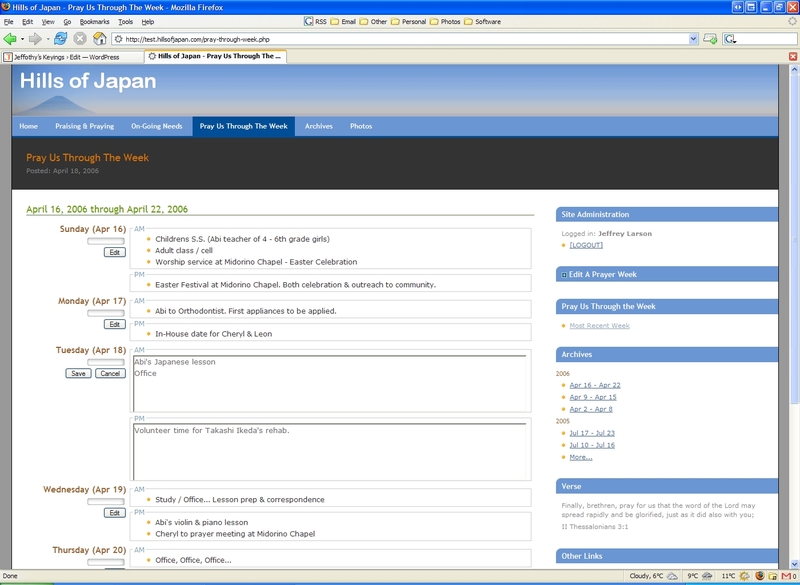 So the Site Administration portion of hillsofjapan.com has been under test for the past 5 weeks or so. A bunch of smaller bugs have been killed and I plan to push it to production this month. You are currently browsing the Jeffothy's Keyings blog archives for May, 2006.